Youth Corridor Making It's Mark! What exactly is Youth Corridor and who is plastic surgeon, Dr. Gerald Imber the man behind it? Fairly new to the ever expanding high end serum market, Youth Corridor is attempting to perfect the “Peter Pan” philosophy by extending the period in a person’s life when they retain that youthful look. 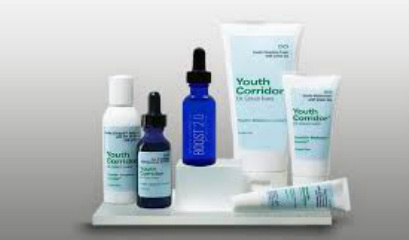 Key to that plan is the Youth Corridor Serum ($125). It is the signature product of the line and contains 10% Vitamin C, E and melatonin. This combination allows the serum to penetrate the skin all the way down to the keratinized layer where it can have lasting benefits. The anti-oxidants work to reduce overall inflammation and increase collagen synthesis that leads to wrinkle reduction and firmer and tighter skin. Only small amounts of the serum are really needed in the morning to freshen up dull, tired or dry skin and the Youth Corridor SPF30 Moisturizer ($45) should follow to provide protection the best part of the day. It tends to be a rather heavy handed serum but it is effective and should only be used on skin that is irritation free. Other products in the fledgling line are the Skin Brightener ($85), Foam Cleanser ($35), Moisturizer w/ green tea ($40) and the Eye Cream ($85). Dr. Imber used his vast experience as a plastic surgeon to develop this serum, and the use of Melatonin which is a naturally occurring hormone that connects with the circadian rhythms of several biological functions. Its lipidophilic property aids in the delivery to the cells vital structures and helps to maintain the activeness of Vitamin C, preventing degradation. To learn more about Dr. Imber’s anti-aging philosophy you might want to track down His book called ‘The New Youth Corridor.’ Published by American Media Inc and priced at $9.95, it will give you a good insight into healthy living techniques along with a comprehensive breakdown of all the anti-aging ingredients. In addition, to his private clinic Dr. Imber is on the staff of the New York-Presbyterian Hospital, and the Weill-Cornell Medical College, and his special interest is in facial rejuvenation and the treatment and prevention of early facial aging.